This top spinner is ideal if you want a quality solution to drying laundry outside. The top spinner rotary dryer gives 50m of drying length within 4.5 square metres. Contains hanging loop for easy storage. 4 robust coated steel arms & sturdy 45mm diameter aluminium main tube. Includes tie cord and metal soil spear. Easy to operate adjustable ‘umbrella’ system. 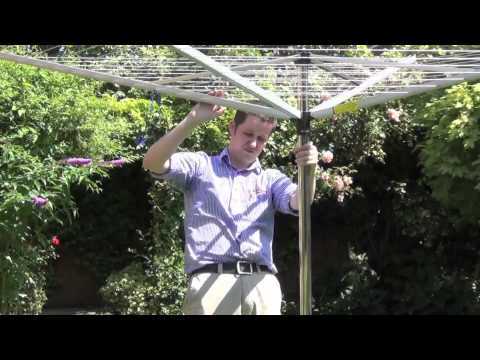 Washing lines can be tensioned in 2 positions. Easy to replace separate lines on each circuit. Extra strong line with non slip profile. Dryer arms turn smoothly even when fully loaded with wet washing. Rounded cord feed through for long lasting lines. The Brabantia 4 arm 50m Topspinner rotary line is easy to operate. It's made from a durable and strong steel frame that can be simply wiped with a clean cloth to keep your washing line in a pristine condition and help prolong its life further. This Top Spinner rotary line will provide you with plenty of room to dry your clothes and laundry outside in the garden. It is environmentally friendlier option to the tumble dryer and it helps keep the freshness of the outdoors whilst it blows through your clothes.It has an adjustable ‘umbrella’ system that can be tensioned in a few positions to cater for your different requirements. Longer heavier items which hang lower can be raised higher in the air by tightening the line. Over time the furthest tension position is used to keep the lines taught. The metal soil spear is included with the dryer and it can be hammered into the garden soil to give you a secure rotary line without having to dig any holes. All four arms are fitted with special holes for clothes hangers which is ideal for drying delicate laundry.